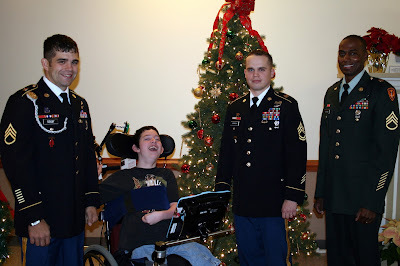 From left, Staff Sgt. Everett Colby, Brandon, Sgt. First Class Justin Hanson and Staff Sgt. Donovan Cooper in the lobby of St. Mary’s Home. About 20 helicopter mechanics instructors stationed at Joint Base Langley-Eustis on the Peninsula donated Christmas presents to the children and young adults who live at St. Mary’s Home for Disabled Children in Norfolk. Three of the instructors delivered the presents to the Home on Dec. 17 and took a tour of the facility. 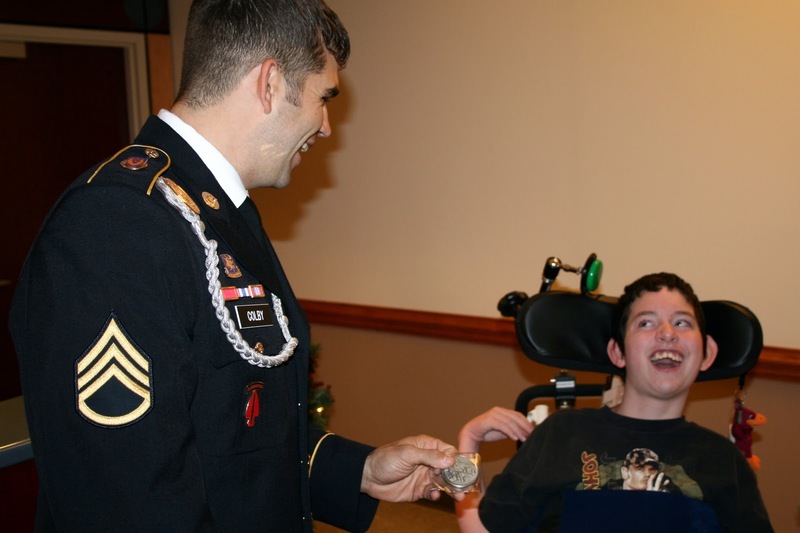 They also presented 15-year-old Brandon, one of more than 80 children and young adults who live at the Home, with a commemorative coin representing their unit. The instructors are with the U.S. Army Aviation Logistics School, a tenant activity at the base.